Jib & Co Productions Inc.
From the smallest production to the largest events, we exceed all of your creative needs. Our staff of experienced professionals is always ready to answer your questions and provide solutions. It is our main goal to provide a product of excellent quality and an amazing customer service experience. From concept to completion, we deliver through a process using client feedback coupled with field expertise. We take ideas, and make them work for our clients. Through in-depth research, planning and execution, Jib & Co. develops media that is functional for you and your target audience. We offer great Jimmy Jib crane packages that adapt to your needs. If you need them on location or in studios, we have the right Jibs. And we also have the perfect cranes for any type of production from Feature Films, Commercials, Music Videos, Reality Shows, Corporate, Concerts to Sporting Events. The Jimmy Jib Triangle is the premiere portable crane for television and film camera support. 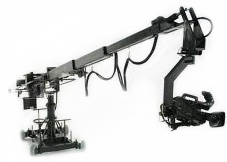 It is available in sizes from 6 to 40 ft. with professional Jib Operators, Tech Crews and on-site support you can trust.